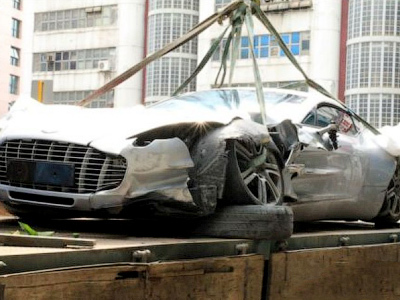 Aston Martin’s most sought-after and expensive One-77 has been wrecked in China in a high-speed accident. This is the first ever known road incident involving the British supercar. Limited to just 77 copies, the model has now become even rarer. Chinese weibo.com site published a photo of the silver-hued lacerated pride of British carmakers piled on a low loader truck. The vehicle is believed to have hit a curb at high speed, tearing out the front left wheel which destroyed the splash board and face bar. Reportedly delivered just weeks ago, the One-77 did not have any plates and was probably neither registered nor insured. The main hull of the carbon fibre monocoque appears to be intact, which means the driver couldn’t have been seriously hurt. The vehicle’s 7.0-litre V12 engine producing 522kW/750Nm looks to be safe, too. While looking nasty, the car certainly could be repaired, but to do so the owner will have to pay to get the damaged beauty to the Aston Martin factory in the UK. The Aston Martin One-77 was released in 2009. The whole line sold out long before production started to customers who pre-ordered their expensive toys. The price of the vehicle varies, depending on the country it has been sold to and the extent of “personification”. In China, this Aston Martin was apparently sold for 47 million Yuan – $7 million – to a customer reportedly from Shenzen. In Great Britain, an Aston Martin One-77 cost ₤1.4 million.